One of the great things about ACT! is its flexibility. You can tailor so much of the application to fit your process. Yes, we know most people install it out-of-the-box and never even relable a single field. (Shameless plug, we can help with that!) One of the simple ways you can customize ACT! 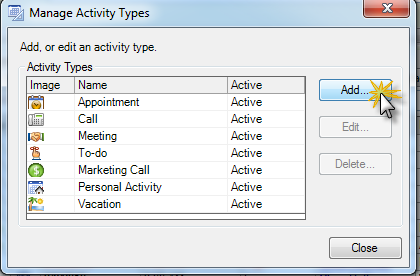 to your process is by creating Custom Activity Types. Because each company’s process is slightly different, the old Meeting, Call and To-do options just don’t cover it. We have customers across almost every imaginable industry. Pharmaceutical reps need to track their doctor’s office “Drop Ins”, another company needs to schedule “Equipment Deliveries”, and yet another has and Activity Type of “Install”. Sure they all have Calls, Meetings and To-dos also, but they have those just outside the box items that warrant a custom type. In the latest versions of ACT!, you, or your trusted TrilogyCRM ACT! CC, can customize the Types. There are a couple keys to this. First and probably most important, don’t get too excited and start creating a custom activity for “Refill coffee”. Wait, that might be a good one, the point being you can get to specific. Think top level when defining Activity Types. There is such a thing as defining Activity Types on too granular a level. A couple good examples are “Types” we customized in our own database – Training & Billable Time. Training could classified as a type of Meeting, but it’s something by which we want to be able to sort our calendars. For me, selfishly, I’ve never scheduled more than 3 trainings a week. Many more than three trainings in a week and not only am I fried, but I can’t speak, literally. My kids love that. Me, I enjoy the talking. Billable Time could be a Call, a Meeting or a To-do. In our case, it’s specific enough that we want to be able to run a report on Billable Time. We need to filter out and report on these specific Custom Activity Types for specific reasons. Once you identify the Custom Activity Types, if you are an Administrator, and have access to your main database, you can create your new Types. Click Schedule, then Manage. Click Add to create your custom Activity Type. Name your new Activity Type something concise, like our Billable Time. A tip most don’t think of, Edit the Results to include the Activity Name. This will be key later when browsing History or looking through reports. “Completed” isn’t nearly as helpful as “Billable Time – Completed”. With custom Activity Types, you’ll be able to schedule, filter, sort and report on your business specific tasks!